I love shoes, I may have mentioned this before. A few months ago, when Stylist Pick launched I took the style quiz thing to find out what my style would be decided as and what items would be ‘picked’ for me. My results contained some hits and some misses. Nothing that wowed me quite enough to purchase. Plus I wasn’t keen on signing up for the £39.95 a month ‘membership’. A couple of months later I spotted a pair of boots I did love, a shouchy ankle boot pair, called ‘Lucinda’ (I can’t find a picture of them on the site now) with a little bit of a chunky heel and very ‘me’ – I liked them, and was going to buy, but they didn’t have my size in stock in the colour I wanted. So I left it. Then over Christmas I received an email where I could order any pair of shoes for £15, so I had a browse, nothing wowed me – until I realised they had the boots I’d previously loved in stock, in black. So I ordered, and went for the free delivery option (3-5 days delivery). I knew there might be a bit of a delay over Christmas – but it got to the 9th and nothing had arrived – I tried to contact them via email (granted, they do say they try to reply within three days but I didn’t want to just wait) so I tried to call them – within opening hours, I was on hold for a couple of minutes then a message came on saying we can’t take your call right now, leave a message and someone will get back to you. This was kinda annoying. Nice of them to let me know, don’t you think? I wasn’t very happy that it took me chasing them to find this out, since the money had already been taken out of my account. But that was how things stood, they offered me the same pair in a size 5 (“Would that be ok?” Er, no… that would be the wrong size) and offered me a 50% discount on another pair. 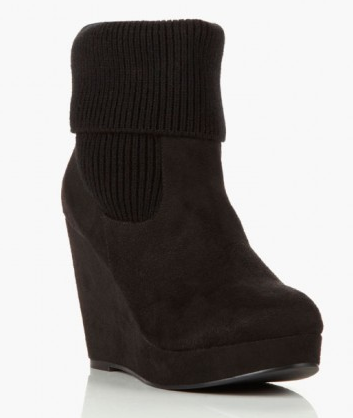 In the end I changed the style of boot I had ordered to a black wedge and requested next day delivery be added. They arrived the next day and they are ok – I’m happy enough to have paid £15 for them, had I paid the full price of £39.95 I would not be happy as they definitely aren’t that high quality. There are glue marks around the edges of the shoe and they generally feel fairly cheap. Which is ok with me, because for me they were. I wanted to blog about this to give readers a bit of a heads up of my experience with Stylist Pick. Overall, I haven’t been impressed and don’t plan to order from them again. I should add that when I have spoken to a couple of people of twitter about this they have said they had much better experiences than I have, with quick delivery and being pleased with their products – so there is every chance that my experience is a one off, but still hoped it might be useful to share. The boots were bought by me. they are stuuuuning. I really could do with a pair like this, that you can dress either up or down! I tried to call them earlier and got the same response of ‘just leave a message’. I’m about to leave them a very angry email now though, as they’ve been taking £39.95 out my account every month for the last three months without my permission. WHAT THE HELL. double check that after buying they didn’t opt you into paying the membership fee, because apparently, you don’t get a choice! Good to hear your experience. Bad customer service really puts me off a company. If they were of better quality I may have been able to overlook the customer service issues you experienced, however since they don’t look that well made, and I have a feeling they would probably kill my feet (! ), I think I will give them a miss! Stylist Pick are truly awful. Their stuff is very bad quality. I have huge issues now with payment as they keep taking money from me even though I’ve cancelled and its an absolute nightmare to return stuff. DONT SIGN UP TO IT! And Cheryl Cole’s stuff is just awful stick to the singing Cheryl!!! !